Lost Springs, Kansas, is a little south of Herington and about 90 miles northeast of Wichita. Unusual retarded and accelerated wheat growth was discovered on June 2, 2006, in the Lost Springs wheat field. To the southwest in Haysville, Viola and Conway Springs, other crop anomalies allegedly have occurred as well recently. Front Page, The Herington Times, Thursday, June 8, 2006. Farm owner, Merle Ecklund, is standing to the right of the westernmost circle in his wheat field. The second eastern circle is behind. Both circles were estimated to be about 28-feet in diameter and both defined by three different heights in the nearly ripe wheat. Times photo by Larry. “WHAT CAUSED THEM? Was there a UFO landing in this field a few months ago? [Mr. Ecklund discovered the two circles on June 2, 2006.] Or was some prankster chemist at work during the winter? Or is there some other rare, but logical and highly scientific explanation? Merle Ecklund of rural Herington would like to know. He found these two unexplainable cupped-out circles Friday afternoon [June 2, 2006] in a wheat field on land he farms just east of 2800 Road, 1 mile south of U. S. 56, in western Morris County. Ecklund said he had never witnessed such an oddity in more than four decades of farming. Both circles were about 19 to 20 feet in diameter. The majority of wheat in the cupped out portions of the circles stands only about 19-inches-tall, but all of the plants have still headed out. Strangely, the wheat plants in the in the outer part of the circles stand about one foot taller than 30-inch tall normal-sized plants throughout the field. The two crop circles might rank as another unsolved mystery in the history of western Morris County. 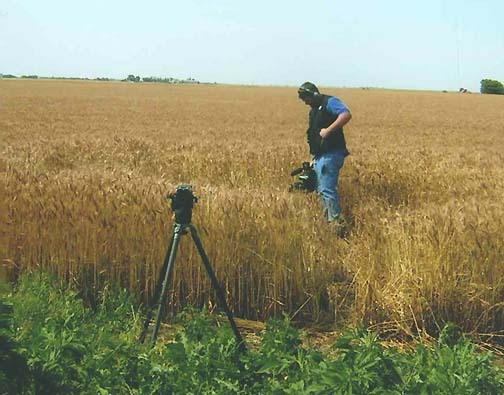 Updated: June 11, 2006 Lost Springs, Kansas – On June 9, 2006, I first talked with Lost Springs, Kansas, farmers Merle and Diane Ecklund about the highly strange accelerated and decelerated growth of wheat in two circles laying next to each other on a west to east axis. 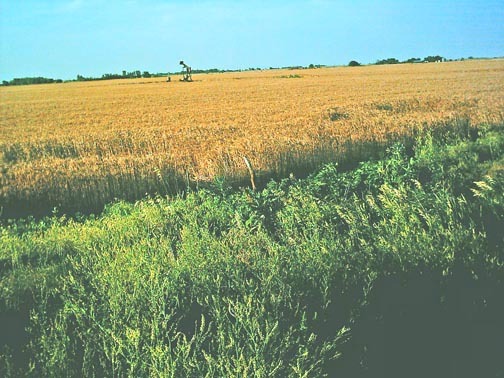 Mr. Ecklund discovered the baffling wheat plants on Friday, June 2, about 2:30 p.m. while he was working along the perimeter of his wheat field. Merle Ecklund, married to Diane, has grown cereal crops on his Lost Springs, Kansas, farm for forty years. Photo © 2006 by Diane Ecklund. 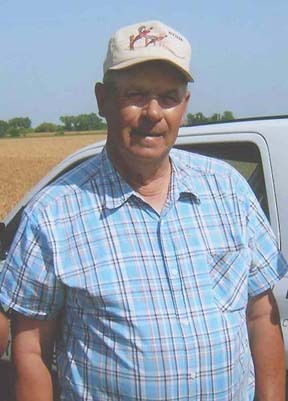 Merle Ecklund, Cereal Crop Farmer, Married to Diane Ecklund, 40 Years Farming in Lost Springs, Kansas: “I was spraying trees along the tree line, the perimeter of the wheat field. All of a sudden I discovered wheat that was taller than the rest of it. And I thought to myself, ‘Why is this wheat taller than the rest of it?” I got off the 4-wheeler and looked. And I said, ‘Oh, my God. Here is a circle and rings in my wheat!’ In all my years of farming, I’ve never seen anything like it!” A second, nearly identical circle, was a few feet to the east of the first one Mr. Ecklund found. Left is western circle; right is eastern circle. Each circle is about 28 feet in diameter defined by three different heights of wheat. Photograph © 2006 by Diane and Renee Ecklund. 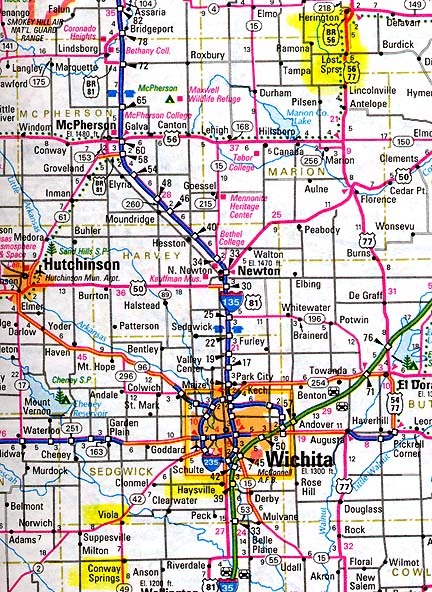 KWCH-TV, which covers Herington, Kansas, broadcast a news report last week about the two odd circles in the Ecklund wheat field. Photograph © 2006 by Diane and Renee Ecklund. There haven’t been any birds or insects in this place where the wheat has grown shorter in the center and longer on the outside. I took my water witching rods (dowsing rods) and they do cross as soon as you get to that area. I also took my dog out there. My dog will not enter the area. Animals know there is something wrong there. IF YOU’RE STANDING ON ONE SIDE OF THE OUTSIDE RING OF WHEAT THAT STANDS 42-INCHES-HIGH, HOW FAR IS IT TO THE OTHER SIDE OF THE RING? On Sunday, June 11, 2006, after receiving photographs from Diane Ecklund and her daughter, Renee, I talked with the farm couple again about the two circles. 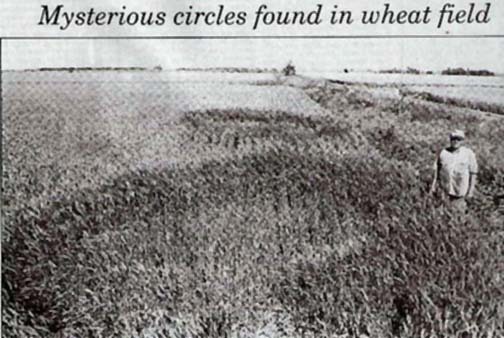 They agree that the centers of both circles were about 15 feet in diameter of wheat only 19-inches-tall. Around that shorter wheat was some normal-sized wheat at about 30-inches-tall. Then around that, forming the outside of each of the two circles, was a ring of wheat standing 42-inches-tall, a full foot above the rest of the normal wheat. “BIOPHYSICIST W. C. LEVENGOOD IN MICHIGAN HAS DONE LOTS OF WORK STUDYING ACCELERATED AND DECELERATED GROWTH IN CROP FORMATIONS. YOU’VE GOT EXAMPLES OF BOTH IN YOUR FIELD. IN YOUR CASE, SOMETHING HAS SLOWED THE WHEAT GROWTH DOWN IN THE CENTER (19- INCHES-TALL), THEN LEFT SOME WHEAT ALONE (30-INCHES-TALL), AND THEN THE OUTER RING HAS ACCELERATED GROWTH AT 42-INCHES-TALL). For further information about the global crop formation mystery, please see reports below in the Earthfiles Archives and my book, Mysterious Lights and Crop Circles, in the Earthfiles Shop.